When many people think about pools, their mind goes to large expansive water areas surrounded by lots of decking. Yes, that is one option but if that doesn’t fit the way you live, don’t let preconceived ideas hold you back from adding a recreational water area to your backyard. As one of the leading designers of pools in the Atlanta area, we keep up with all the trends in pool design. The greatest benefit of working with Hutcheson Horticultural to build your new pool is that you are not just working with someone that will build your pool, we will design and plan all of the surrounding landscape. In other words, we are a “one stop shop”. Smaller and more intimate pools, often used in small backyard or courtyard designs but are also becoming a popular element of outdoor living areas versus a full size swimming pool adjoining the area. They are popular because they give a place for relaxation, socializing and cooling off in hot summer months. If you think lap pools are used only for exercise, you would be wrong. When people refer to lap pools nowadays, they are probably just as likely to be referring to the shape of the pool (narrow and rectangular) as to what the pool will be used for. 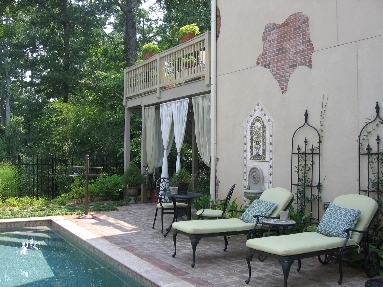 This style of pool is becoming more and more popular as a way to make a backyard look more contemporary. The popularity of what are also called zero or disappearing edge pools continues. These pools are fantastic if your site features a downward slope with a view beyond. The lack of an edge draws the eye out past the pool and on to the view. No matter what style of pool is your choice, Hutcheson Horticultural can work with you to bring it to life. Contact us for a swimming pool design consultation by phone at 770-924-1001 or use the convenient “Contact Us” feature on our website.